UAB"ŽYBARTUVA" has been founded in 1994. Starting from 2000 we are joint-stock company with Swedish stone company "A P Sten". We employ more than 40 professional and skilled workers, who has big experience in stone production activity. 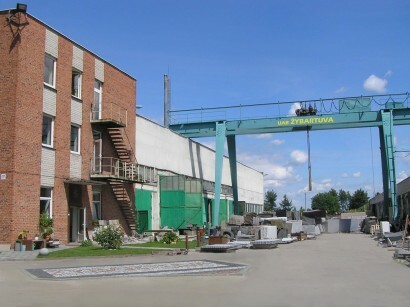 Our production site is placed in Baltoji Voke, 30 km from Vilnius. The premises of 5.000 m2 offer a big stock yard and a factory that can produce stone products of high quality. We have very good technical resources, such as block saws, edge cutting machines, polishing machines and NC-operated machine for production of kitchen tops. That in combination with our skilled workers, gives us the opportunity to offer granite, marble, sandstone or limestone in various finishing of surfaces, like polished, flamed, honed and bush hammered. Most of our products are custom-designed. We are a direct importer of natural stone to Lithuania. Since we are a part of the international stone company group ”A P Sten” with quarries in Sweden and Norway, and trading companies in Sweden, Norway and Poland, we have good connections with suppliers from all over the world. We are also a producer and exporter of high quality tombstones to Scandinavia, Russia and Latvia. We are ready to produce everything from granite, marble, sandstone or limestone. Our products usually are produced for particular customers.